The bundles just keep coming. Microsoft's latest attempt to woo over the general consumer audience is a double-game bundle deal. 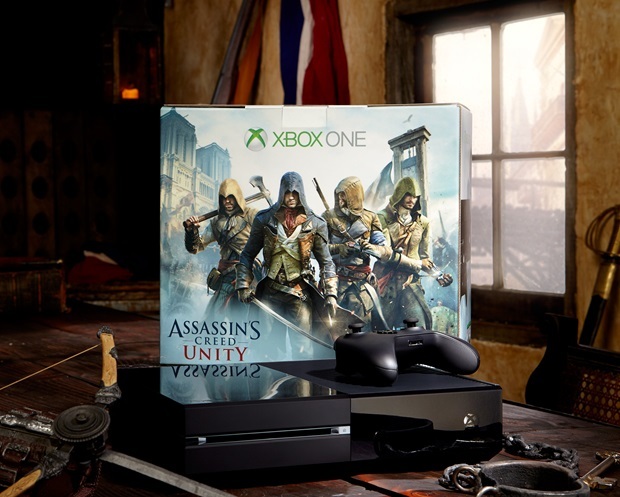 This time they're not only packing in an Xbox One ($399 without Kinect; $499 with Kinect) and a brand new game like Assassin's Creed Unity, they're also tossing in Assassin's Creed IV: Black Flag at no extra charge. Microsoft has been using the bundle deals to push (or nearly force) the Xbox One into as many homes as possible, since they haven't been able to fare well at all when it comes to selling consoles at the same price point as the PlayStation 4. Heck, it was doing even worse before when it was standard $500 and bleeding mind-share and install-base potentiality like nobody's business. Phil Spencer, the head-honcho over the Xbox brand department, has been working tirelessly to help shift around the consumer market perception of the Xbox One following the summer of DRM. Some of those shifts included removing Kinect from the package to give consumers the option to pick up the new console for $100 cheaper, as well as announcing a bevy of bundle deals for the system, one of which includes the Madden NFL 15 . Well, if the Madden bundle worked out as well as Michael Pachter has predicted, then it's no doubt that Microsoft would go for more bundle deals... even if it means cranking up the free game count to two... count 'em, two. To help drive the point home they even have a domestic revolutionary promo poster to get gamers excited, thrilled, and the money pumping through the veins of their wallet for some holiday shopping adventures. Oh man, look at all that rustic justice. I'm betting people are getting all fired up with patriotic enthusiasm just looking at all that revolution triggering. Anyway, I can't say that I would be thrilled about the bundle if I didn't already have an Xbox One. But I would say that it would at least give me pause seeing two games being packed into the deal to help move some extra units. I'm just keen on the whole digital coupon thing. It feels cheap. Regardless, in my opinion the Wii U is still the console that seems to carry the most appetizing and unique games this fall, especially with Super Smash Bros. on the horizon and Bayonetta 2 and Hyrule Warriors fleshing out a very unique stash of exclusives. So far only Halo: The Master Chief Collection is really giving serious buy-worthy weight to the Xbox One's consumer appeal. Although, I do suspect that Microsoft constantly giving away two free games in their ever-increasing bundle deals might help expand some of their market growth for their third-generation home console. The Assassin's Creed bundle will be available November 2nd, with a pre-download queue made available for Assassin's Creed Unity. If you get the Xbox One bundle with Kinect, there's an additional free version of Dance Central that comes with it, making it three free games for $499. You can learn more about the bundle by visiting the official website.